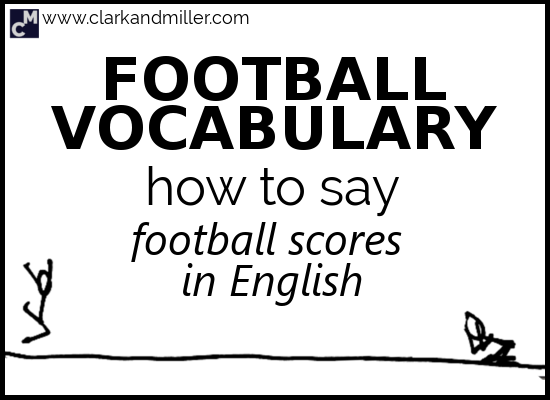 This is part one of a series on football vocabulary in English. If you want more, check out 9 People in Football (And What They Do) and Football Vocabulary: 23 Essential Words and Phrases. You might hear this a lot in the next couple of months as everyone goes football mad over the World Cup. Or at least until their team gets knocked out. It seems easy, doesn’t it? OK. So no one won the match. How annoying! … or eighteen all — if you’re watching a children’s match. For a start, when talking about football scores, we don’t say “zero,” but we say “nil” instead. Scotland beat England two nil. Scotland defeated England two nil. Or you can forget about the score and just say who won. In the unlikely event of this score, there’s another verb we can use to show the huge difference between the number of goals. It really shows how amazingly Scotland won and how badly and embarrassingly England lost. That verb is “thrash.” Yep — like thrash metal. But with football. OK. Now you know how to say football scores in English. You’ll know how to answer. Thank you very much for those “football scores”phrases. I find them really helpful because they aren´t normally taught at school or included in textbooks. I hope you have fun using what you learned! I’m glad you enjoyed it, Marina! Thanks a lot. next week we are having a summer camp and I was planning to make football one of the topics to teach – given the World Cup. So it is absolutely great and useful. I’d love to know how well the post adapts to a proper lesson. Would you be able to let me know how it goes? I love that Scotland won some of the matches in these examples! Thanks for letting us win for once! We have a hard enough time just qualifying for competitions, never mind winning the matches! It was quite difficult choosing which teams to represent. So I thought I’d go for the coolest underdogs around! Excellent post, as always. By the way, it seems to me that you aren’t a huge fan of England Right? Taking into account that Scotland don’t participate in this Football World Cup, which national team you root for? Actually, it’s not that I don’t like England, but more that I love supporting the underdog. There’s a game I play with my partner sometimes: we name two national football teams and decide which one we’d root for if they had a match. The idea is to always go for the underdog. So I don’t support a particular team but it just changes from match to match. We were ahead of 2-0. Is the sentence correct? Almost — We’d say “We were ahead 2-0” (no “of”). Why past simple? Another good question! When we’re asking for something specific in the past, we should use the past simple, not the present perfect, even if we have that feeling of the effect still being with us in the present. See what happened? As soon as it got specific, the dialogue switched to the past simple. It helps a lot. I work as a P.E teacher in a Spanish Secondary School. When teaching CLIL groups I have to come up with ideas to get the students engaged in the lessons while help them improve their speaking skills. So I’m going to stick signs on the gym’s wall to help them comment on the match scores right after finishing 5 minute sport matches. I didn’t know whether to write “What’s been the score?” or “What was the score?”. Nedlless to say both your website and your answer are really helpful . Thank you very much Gabriel! That’s such a great idea for a CLIL PE class! I’m not much of a sporty type, so if you have any other areas of sporty English that you’re not sure about, let me know! I can see if we can do a post about it.